We hope you’re not too worried about your calorie intake because this is a game for those with a real sweet-tooth. In a land of cotton candy and many different colours of hard and soft candies, any diet goes out the window. A place where soda fills giant glass containers, where each new level brings more sweets to the reels – who can possibly resist such sugary delights? The graphics of Sugar Pop Double Dipped slot (or simply Sugar Pop 2), won’t be everyone’s cup of tea, but we’re quite fond of them. Played on a massive 7×7 playing field with cluster wins, this new Betsoft slot machine also offers players a myriad of bonuses to go along with it. 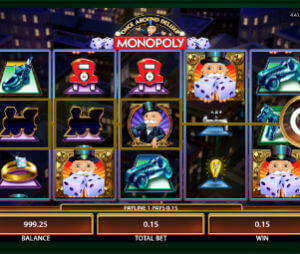 You have cascading reels, which give way after wins to allow new symbols to fall in their place, as well as an extensive leveling system, along with a total game score that both incentivize long-term engagement with the slot. Betsoft has not given us any information regarding the volatility of Sugar Pop 2 slot. We do know the RTP sits at 96.42%, which is average. This is definitely a downgrade from 97.6% of the original Sugar Pop slot and cannot compete with Good Girl Bad Girl, At the Copa and some other BetSoft classics. Cluster Wins & Cascading Reels – This is the sort of combination we fell in love with when Gonzo’s Quest first came around, and we’ve loved it in almost every iteration of video slots that’s since come out. It can be a bit annoying at times, we’re not going to lie – but at the same time, when it all starts to give way, and the symbols start piling on top of each other, blowing up and leaving Wilds so they can make more wins – there’s no rush like it, short of winning a slot’s jackpot. Progression & Upgrades – As with most games of this nature, your progression is inhibited by luck, but it provides a good reward to players that keep returning to the title and investing their money into it. As you keep playing, your level goes up, and every four levels, you are rewarded with additional candies that can make an appearance in a surprise egg. Their effects range from casual to outright broken, with the more powerful bonuses being locked at the very end of the leveling curve, which you won’t see unless you invest some serious cash and time. Unknown volatility – Without knowing the variance of the game, we can’t readily recommend it to players to try it out for their own cash. Our educated guess here would be a high variance game, as it pairs well with the long-term investment that Sugar Pop 2 is, but don’t take our word as gospel – this is information only the developer themselves can provide. Upgrades take too long – This is both a positive and a negative, but we feel it was worth mentioning here. It will certainly make players who invest time into the game feel properly rewarded, but it’s fair to say that a lot of players may never see some of the unlocks as the number of upgrade symbols needed increases dramatically further up the levels you go. Sugar Pop 2 has plenty of bonuses that are unlocked by levels, but they’re quite numerous, so we won’t cover them. Beyond them, you have two to consider. Cluster wins that have more than five symbols activate the bomb, which will be created where the win occurred and will blow up an area around itself. Depending on the win size, the area affected is also increased, capped at 20 symbols. Free spins symbols come in their own candy flavor. 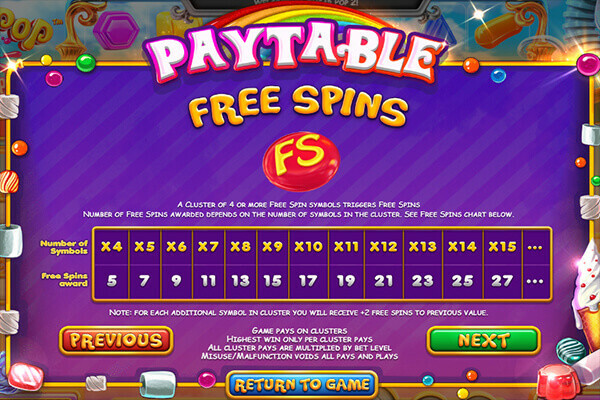 Collecting four or more rewards free spin, with the number increasing depending on how many free spins icons were part of a paying cluster. You can win additional free spins during the feature itself. This must be one of the better releases Betsoft has ever made, in our opinion. Sugar Pop 2: Double Dipped has a myriad of features, interesting gameplay that shakes up the standard formula, and an above average RTP that players can enjoy. Again, we don’t know the game’s variance, which is its only stain in our eyes.